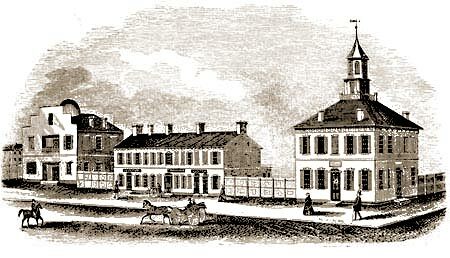 Columbus as it appeared in the 1850s. View is looking south with North High Street in the middle along with the first Union Depot. The history of Columbus goes back before the establishment of Franklinton, the village that Lucas Sullivant built on the west side of the Scioto River, even before there were any settlers in the area, even before the Native Americans that were using the land when the first white explorers passed through. Before these people there is evidence that there was a large group of people that lived throughout the Scioto Valley area as far back as 3,000 years ago. These people lived in large communities with many smaller communities. The reason we know this is that they left fortifications made of mounds of dirt. 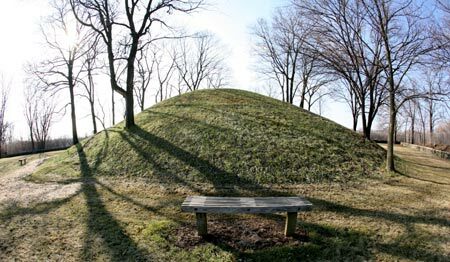 Shrum Indian Mound on McKinley Avenue is just one of many Indian Mounds that were in Central Ohio. Mound Street in downtown Columbus was named because there was a very large Mound right at the intersection of what is now Mound and High Streets. Early settlers to the Ohio territory found these piles of dirt everywhere. Some took on the shape of walls that probably surrounded villages. Archeological evidence shows these included wooden dwellings because we have found remnants of wooden posts, fire pits, even trash pits where they buried their refuse. Other piles of dirt were places where they buried their important dignitaries. Excavations of these burial mounds showed that they started with a small wooden house where they would place a recently deceased person. This house would then be burned down, and the remains would be cremated, then the ashes would be covered over with dirt. When the next dignitary died, the same process would be repeated again in the same spot and over the 100s and 1000s of years, some of these mounds became quite large. This group of people we call the Mound Builders. They had an extensive Nation that covered much of the Midwest and they traded with other groups of people from around the world. We know this because the archeologists have found artifacts that could only have been made in one place, often 1000s of miles away from Ohio. By the time the people we now refer to as Native Americans came to the Ohio Territory, there is no record of encounters between themselves and the Mound Builders. Why they disappeared, or if they left the area, where they went is unknown. Some theories suggest that there was a major climatic shift with wide-spread droughts that caused the demise of these early Americans. What we do know is that when Native Americans migrated through Central Ohio, they too found the Mounds, but their verbal heritage could not explain their existence nor did they mention finding any people living in the area. Native Americans usually didn't stay in one spot for long. They migrated with the weather along with the roaming herds of animals. In time, these roaming groups of people developed regular trails they used. 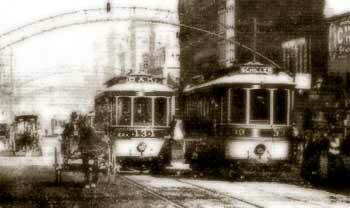 In Central Ohio there were two main trails that intersected pretty close to where Broad and High Streets are today. The north south trail ran from the Ohio River north along the Scioto River up to Lake Erie. The east-west trail ran from northwest Ohio, down through Columbus and then turned southwest into the Hocking Hills area. Before Columbus was established, the land east of the Scioto was mostly uninhabited and heavily forested. There were numerous Indian Mounds in the area. The area was designated as part of the Refugee Tract which was land set aside for residents of Nova Scotia that supported the American Revolution. However, when the Revolutionary War came to an end, they found themselves on the short end of the stick when the new American government gave up any claim to Nova Scotia and left it for the British. In an effort to make things right, the federal government gave these families land in the Ohio Territory. However, most of them decided not to make the treacherous move to the Ohio frontier and opted instead to sell their land rights to land speculators. That is the reason Lucas Sullivant established Franklinton on the west side of the Scioto, as this land was available for purchase, even though it was clear the Scioto frequently flooded the area with devastating results. The frequent flooding of the area also created superior top soil for growing corn. Unlike many towns in Ohio, Columbus did not begin as a settlement of early pioneers that clustered together for support. Columbus grew from speculation by a few men then living in Franklinton. Ohio's capitol was originally in Chillicothe. However, many complaints came from legislators in northern Ohio that had to travel to Chillicothe. The capitol was then moved to Zanesville in an attempt to appease more people. This proved unsatisfactory as there were not enough buildings to house all the members of the assembly, so the capitol was temporarily moved back to Chillicothe where a committee was formed to find a new location that would make almost everyone happy. A law was passed that said the new capitol had to be within 40 miles of the center of the state (Zanesville and Chillicothe were both outside this limit). The committee looked at suggestions made by a number of small communities that had sprung up over the past decade. The one very big plus that gave the edge to the Columbus site was the land and buildings donated by 4 men living in Franklinton. Lyne Starling, John Kerr, Alex McLaughlin, and James Johnson (all associates of Lucas Sullivant) pledged 20 acres of ground to the state, plus construction of the necessary buildings to house the state government. Ten acres were designated for the Capitol, and 10 acres were designated for a new state penitentiary. To complete the deal, the men also offered a $50,000 bonus to the state if they would locate the new town across the river from Franklinton. That was the clincher. And the name of this new center of state government: Ohio City! The new city to be, was first laid out in 1812 by surveyors that picked their way around the scrub brush and trees that filled the high side of the Scioto River. The new city wouldn't be incorporated until 1816. When Ohio legislators were considering the name for their new capitol city: Ohio City was the odds on favorite, proposed by Abraham Edwards of Montgomery county. However, that was before a little discussion held at a local tavern in Franklinton among some of those legislators and Joseph Foos. Foos was a popular tavern owner in Franklinton and not without a strong point of view on many subjects. He owned the first ferry that he and his friend Lucas Sullivant set up to cross the Scioto River. He was also a strong militia leader in central Ohio. The other thing about Joseph Foos was that he was an admirer of Christopher Columbus. Joseph Foos, as were many of his fellow residents of Franklinton, were primarily adventurers and explorers. They understood what it meant to leave familiar surroundings, putting their lives on the line by going into uncharted waters, just as Chris Columbus did over 300 years before. When Lucas Sullivant named his new settlement Franklinton, he did it to honor Ben Franklin who had died just a few years before. Joseph Foos also wanted to pay homage to someone he admired. When Foos found out what his fellow legislators were planning on calling the new town, he invited them across the river for a little social get together. There were no minutes of that little party, but I'm sure alcohol played an important part in the discussions. What is known is that after that meeting, the decision had been made to recommend the new town be called Columbus, and not Ohio City. By a vote of 19 to 22, the Ohio Legislature decided not to name the new town Ohio City and instead adopted the name Columbus. By 1815, the new statehouse was being built on the corner of what is now South High Street and State Street. Just north of the 2 story brick structure was the state office building. The population of Columbus was around 700. Construction of the new state penitentiary was built where today stands the the Cultural Arts Center (the old state arsenal). Before Columbus had even been completely laid out, the United States had declared war against Great Britain on June 18, 1812, the same day that the first lots were sold in Columbus. In time that war would be called the War of 1812. Columbus and Franklinton were the western frontier staging and supply center for the federal troops and militia. Following the war, the great influx of people left and it became extremely difficult living in Columbus. Disease and poverty were daily struggles facing the residents in the once booming town. By the 1820s land prices had dropped to next to nothing. Many people abandoned their property and left town, but some stayed and in time things began to improve. Looking north at the covered Broad Street Bridge. When the National Road came through Columbus in 1837, a bridge was built across the Scioto River to replace the ferry service. Much of Columbus's rebirth could be attributed to its proximity to major transportation routes. 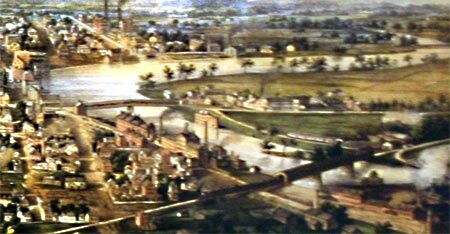 Columbus was connected to the Ohio and Erie Canal by way of a 11 mile feeder canal that connected Columbus to the canal at Canal Winchester. That was in September 1831. By 1836, the National Road had extended from Cumberland, Maryland, to Columbus, and within the next several years eventually extended all the way to Illinois. In the 1840s and 1850s, railroads and telegraph lines connected the capital to other parts of the state as well. 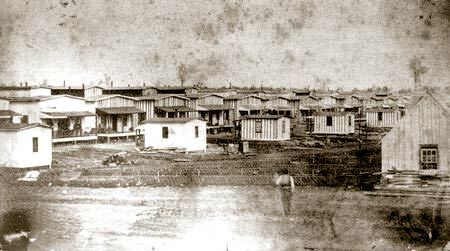 Camp Chase during the Civil War. The camp started out as the main training grounds for Ohio's Union soldiers. After they left to fight, the camp was turned into a prisoner of war camp that housed 1000s of Confederate Soldiers captured during the war. Today there is a cemetery located where part of the camp was located. In the 1860s, when the Civil War broke out, Columbus once again became an army town and the population again surged when 1000s of young men came to Columbus for training. There were army camps almost everywhere including the statehouse grounds. The largest camp was located just west of the downtown at Camp Chase, but there was also a camp at Goodale Park, the Columbus Barracks where Ft. Hayes is today, another camp where Ohio State University is now located, even the State Penitentiary housed Union soldiers preparing to enter the war. After the Civil War, Columbus remained a strong community with plenty of industrial growth. The growth of the railroads during the war insured that Columbus was well connected with the rest of the country. Following the Civil War, the Grand Army of the Republic (GAR) was created to promote the welfare and a powerful lobby for Veteran's rights and increased benefits. In 1888, the GAR decided to meet in Columbus for one last big gathering. This would be the largest gathering of Civil War veterans since the end of the war in 1865. 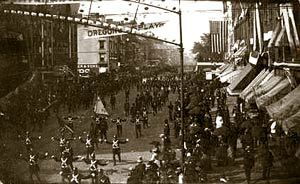 Over 250,000 veterans and their families would descend on Columbus in the summer of 1888. At that time Columbus had a population of around 80,000 residents. Imagine having to suddenly, and for a few weeks, having to house and feed over three times the total population of the city. Today, that would be the same as having over 3 million people come to Columbus for a 2 week convention. Besides working out where to house the GAR veterans, city fathers also wanted to make an impression of these visitors. An overpass was built on North High Street so the parades could pass by Union Station without being held up by train traffic. Arches were also built along North High Street. Each of these arches were lit with natural gas that made the street bright as day. When the Civil War vets left town, the citizens convinced the city that the lighted arches should stay. Columbus soon became known as Arch City. Lucas Sullivant was a surveyor, soldier and explorer who first came to central Ohio in 1795 along with a small group of men who were surveying the land on the west side of the Scioto River which was called the Virginia Military District. Sullivant had no intention of staying in Ohio, only to get the survey job done, get paid and move on to his next assignment. Little did he realize then what an important role he would play in the future settlement and establishment of the largest city in the state of Ohio.